These bags are manufactured completely by machine, and as such are limited in the sizes available. The printing can be up to full colour including spot colours. Usually the total number of colours can be 8 (so 4 spot colours and process print too). 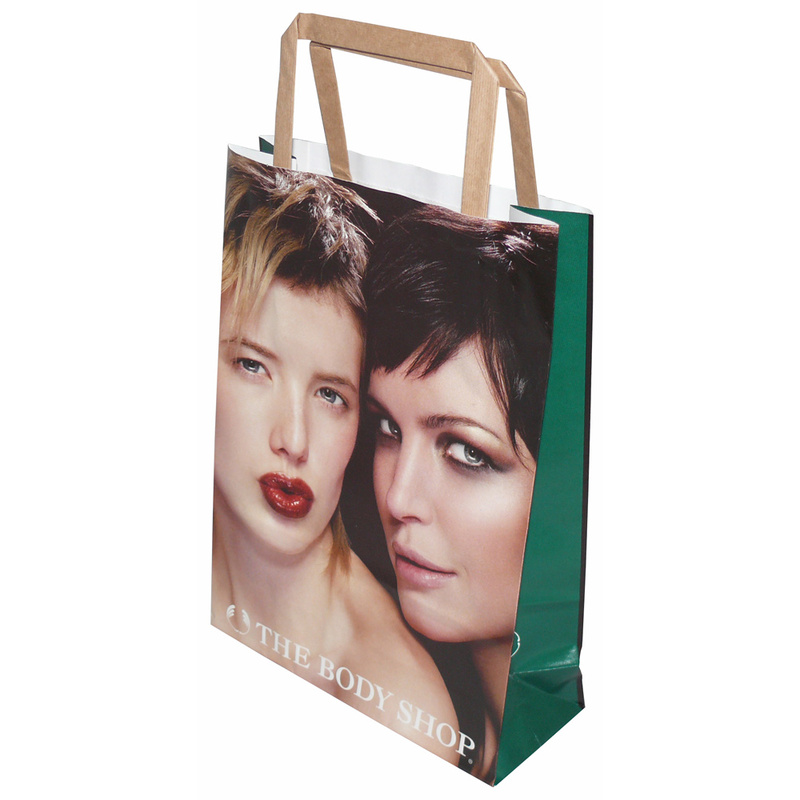 The bags are manufactured from medium weight papers and are aimed at being a cost effective yet environmentally friendly quality paper bag. These are completely degradeable and most sources of the paper are from recycled material to some extent. The handles on this type of bag are supplied within the bag, glued to the bag using a paper patch. For use the handles can be easily lifted out and contents entered into the bag. Because the handles are within the bag, box sizes and shipping are reduced - yet another eco friendly reason to buy this style of carrier bag. They are manufactured in a variety of countries, so the smaller the packaging, the lower the carbon footprint. We supply various types of full colour internal tape handle sos paper carrier bag. Beckdale.co.uk staff assist throughout, helping stores purchase tailored full colour internal tape handle sos paper carrier bag. To obtain choose by material or similar , get in touch with our offices via your preferred method.